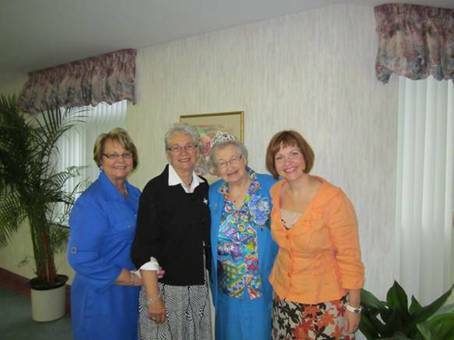 Etta Snow graduated from UCTS (one of the forerunners of CCS) 60 years ago, in 1952. The Ovimbundu have a very beautiful and meaningful phrase- ‘Ongeva ka yi popiwa’ literally means, the longings of the heart can never be erased as they are etched in one’s whole being. When I think of my beloved sisters and brothers in Angola who nurtured me in my faith journey as I served among them for over 20 years of my 60 years in ministry The words of Abraham Lincoln come to mind when he wrote, “It is not the years in your life that count, but the life in your years.” Truly God has richly and abundantly blessed my life lo these many years, but that is not to say that there have been no curves, disappointments, or detours along the way. In my journeying through life from the mountain tops to the deep valleys, my firm belief in a God of love, justice, peace and forgiveness, has given me strength, courage and hope to continue to discern what is His will for me. Coming from a Christian home, interacting with church leaders during my four years of teaching in Newfoundland, and being actively involved in leading Christian Education groups -all contributed significantly to my responding to God’s call to full time service in the church. Following graduation from the United Church Training School in 1952, I , along with three other young women was appointed to work with IECA (The Evangelical Congregational Church of Angola in partnership with the United Church but before arriving there, it was a requisite to learn the Portuguese language. Within the year, we left Lisbon, Portugal for Angola. Shortly after our arrival there, we began to study Umbundu .. A difficult language to grasp, but so necessary for us to have communication with the people. When I was leaving on my first furlough in 1956, the U.C. missionary community asked me to be their representative at General Council. One day in conversation with the late Rev. Dr. Harriet Christie at Covenant College( later CCS) I discovered that as a missionary at GC., I would not be able to vote, but if I were a deaconess I could. What process then would be necessary for me to become a deaconess, I inquired of Harriett?. She replied, that she would set the wheels in motion, and together with those who were to be ordained, commissioned and designated, I became on June 11,1957 a member of the Deaconess order of the United Church of Canada. How proud I was to be a Deaconess, and also to have the privilege of being a voting member at GC. experienced a courageous faith community vibrant in its faith, and bravely committed to preach God’s reconciling word of love, peace, justice and forgiveness. As the political situation worsened at the Dondi Mission, it seemed expedient that we leave (except the late Dr. George Burgess) in September 1975.. This was for me, as well as for my other three colleagues, a very painful, tearful and heartbreaking decision. Upon my arrival in Canada, I began deputation work for the Overseas Mission Board.. Thinking that there was still a possibility to return to Angola, I accepted the job to work as Director of Residence at the Centre for Christian Studies. During this time I completed my theological studies, and was ordained by Toronto Conference, on behalf of the NL Conference, May 11, 1976. The next few years I served five Pastoral Charges , where I had many opportunities and challenges to share my gifts and skills. During this time, I also was privileged to visit Namibia, (accompanied by Kay Pearson), where there were many Angolans who had fled from war torn Angola. At this time, The Angola Memorial Scholarship Fund supported over 300 refugee children to attend various schools in the country. Once the peace agreement was signed in Angola in 1992, AMSF was able to support many educational and women’s projects. As Corresponding Secretary of AMSF, it’s been a tremendous experience to see the growth and development of these projects that are uplifting the spiritual, social and economic life of many Angolans. Women are being empowered to take more leadership roles in their communities and with AMSF support are using their new skills to maintain a decent standard of living. As I reflect on my 60 years of ministry, I can truly say my cup over-flows.Travelling to many new places like, Australia, New Zealand, South Africa, Trinidad, Bermuda, Zaire, European Countries, Ireland, London, Hawaii, and a few places in the United States broadened a deeper understanding of people, their customs and cultures., and with a deep appreciation for the rich fellowship of the World Wide Church. Other exciting events included 3 wonderful. joyful and humbling visits to Angola, the first with Kay Pearson, the second trip in 2004, I was accompanied by the Very Rev. Dr. Marion Pardy, and in 2010, by Mrs. Jean Burgess, Past President of AMSF. There are also many wonderful memories of my 3 visits to the World Council of Churches. in Vancouver, Zimbabwe and Porto Alegre (Brazil). Up to last year I served as Chaplain at the Old Mill, performing weddings, which enabled me to support financially repairs to some of the school buildings in Angola that had been destroyed during the civil war.. Occasionally I do worship services at my home church-Humbervale United where I have the hono r of being named Pastor Emerita. What a journey it has been!. Whatever has been accomplished it is because God’s Amazing Grace has supplied my needs. Let me say, that never in my wildest dreams did I even envisage how blessed I am to be one of Christ’s followers sharing in His messages of Love, Justice Peace and Foregiveness.. Yes, my life is indeed rich and full, because of those who have supported and nurtured me in my faith journey..True, I have ministered to many people in my 60 years of ministry but the greatest blessing of all that I have received and experienced, is from those who have ministered to me. To quote some of Robert Frost’s great lines in his poem, “I still have promises to keep”, places to go, people to visit, things to do, : and “miles and miles to make before I sleep”. As CCS is celebrating its 120th Anniversary, let me offer my grateful thanks to those who had the vision of years past to establish Training Schools where young women, and in the latter years young men, were able to use their God given gifts to bring Life in all its fullness to people all over the world. Our prayer is that CCS. with its various exciting courses and programs will continue to challenge young and old to respond to God’s call, Here am I, send me. Thanks be to God!.